How to draw a Process Flow Chart? It's very fast and easy to draw any Process Flow Chart using the tools of special Process Flow Chart software free. 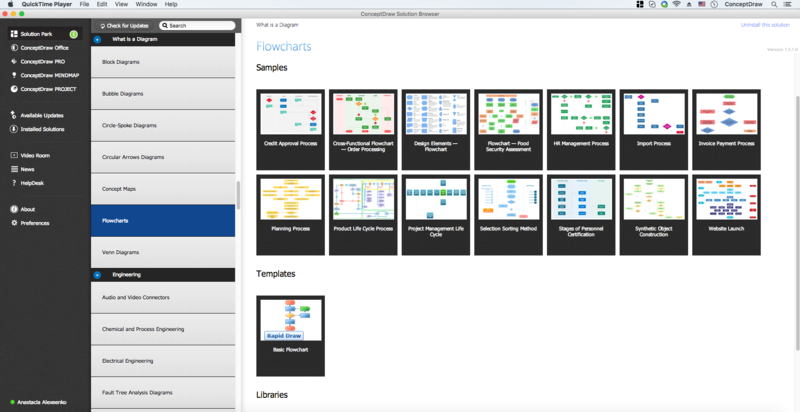 In this connection you will benefit from the use of ConceptDraw DIAGRAM software extended with Flowcharts solution from the "Diagrams" area of ConceptDraw Solution Park. Flowcharts Solution offers wide set of useful drawing tools, collection of samples, ready-to-use template and 2 libraries with predesigned vector elements which will help facilitate drawing process and designing professional looking Process Flow Chart, Process Flow Scheme, Process Block Diagram, etc. ConceptDraw DIAGRAM v12 enhanced with Flowcharts Solution from the "What is a Diagram" Area of ConceptDraw Solution Park is a powerful Processing Flow Chart software which will help save lots of your time.